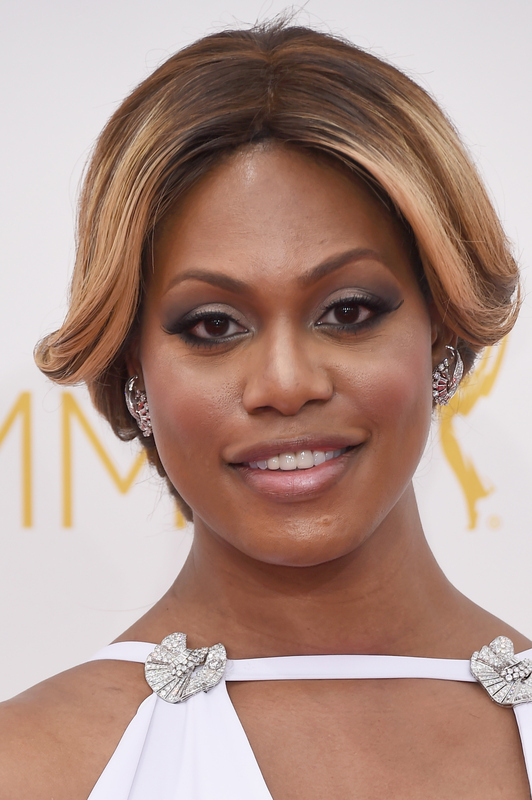 After Sunday night's MTV Video Music Awards, I could not wait to see Laverne Cox's Emmy ensemble. After all, if she looked so smokin' hot at a show where she wasn't even nominated, I was prepared to be absolutely floored by her 2014 Emmy outfit choices. Now, of course, her sequin Marc Bouwer mini dress was nothing to turn your nose up at, but Laverne Cox's white, floor-length dress (Marc Bouwer again!) at the Emmy Awards on Monday night was completely flawless. Although we already know her co-star Uzo Aduba won Best Guest Actress, Cox had plenty to look forward to for the Emmys. OITNB is nominated for 12 awards, including Outstanding Comedy Series and Outstanding Casting For A Comedy Series (duh — their recent group Instagram photos only further cement the fact that they're the cutest ensemble in the history of the world). For literally anyone else on the planet, this gown might have been pretty difficult to pull off. Its Ancient Greece-inspired silhouette is incredibly striking, but with her tall, statuesque figure, Cox completely rocks the look. The flowing deep V is offset by sleeve details that flow into a long train that's incredibly glamorous. Between this and Sunday night's dress, it's clear that Laverne Cox will be topping best dressed lists for a long time coming.